Telinta’s white label cloud-based solution enables you to offer Mobile Top-Up services to an unlimited number of resellers. Using our industry-leading Mobile Top-Up partners via convenient APIs built into our hosted softswitch and billing platform, you and your resellers can process payments to hundreds of mobile operators around the world. Our brandable multi-language web portals help you to serve resellers, distributors, agents and end users virtually anywhere in the world, in any currency you need. We provide easy access to your credit card processors, our unique PayPal plug-in, and other resources. 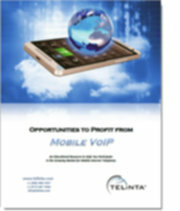 In addition to resources for your Mobile Top-Up business, Telinta provides you and your resellers with a full portfolio of hosted VoIP solutions such as mobile calling via a smartphone app for both Android and iOS, MVNO, Call Shops, Calling Card and Pinless, Business and Residential VoIP, and more. Click here to see a sample Mobile Top-Up webpage. Does Telinta provide Mobile Top-Up? Telinta does not provide Mobile Top-Up services, but instead we enable our customers to use our cloud-based Mobile Top-Up solution to access their own account with DT One (formerly known as TransferTo) and Prepay Nation. Telinta customers can provide Mobile Top-Up services to an unlimited number of resellers, distributors, agents and end users via our brandable self-service multi-language online portals. Can my resellers have their own resellers? Yes. With Telinta, your resellers can have multiple layers of resellers of their own. Our white label solution enables our customers and their resellers to each offer services under their own brand. Our platform also enables you to easily calculate commissions at every level. Telinta enables you to use your own provider of payment processing for credit and debit cards. Many major payment processing companies are already integrated into our platform for fast, easy access. Telinta also provides a convenient PayPal plug-in as an option. Our brandable multi-language web portals also enable your agents to manually process cash payments. You can do business in as many currencies as you need. What other services can I offer? Mobile Top-Up providers and their resellers often offer additional services such as mobile calling via a smartphone app for both Android and iOS, Call Shops, Calling Card and Pinless, Business and Residential VoIP, MVNO SIM card services for travelers, and more. When you become a Telinta customer, you have access to our complete portfolio of cloud-based brandable VoIP solutions, without needing any special equipment or technical expertise. The VoIP services you offer via our award-winning TeliCore softswitch platform can be topped up by your end users via our brandable online portals, without needing third-party Mobile Top-Up providers. With Telinta, you can offer both prepaid and postpaid services.